Reinventing a tired, old landscape can be more challenging than creating an entirely new one. An existing landscape, especially one you may have had a hand in installing and even maintaining, can feel “comfortable” to you. It has slowly evolved over time and become familiar, so you may not even notice the weak spots and problem areas that have grown along with it. That’s all the more reason to take a deep breath and take stock of your landscaped space and the elements in it. 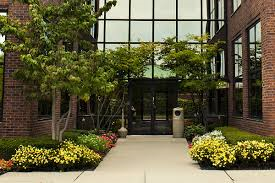 It’s time to reinvent your commercial landscaping and turn it into something new, fresh, and vibrant. Identify key visual areas Focus on highly visible areas as good places to start for maximum visual impact upfront. Working on smaller areas also enables you to better manage the tasks at hand and not get overwhelmed by working on the entire campus. Take inventory Look long and hard at each and every component of your landscape and evaluate it objectively. Keep features and plants that still look good and serve a purpose and lose the stuff that doesn’t. Get rid of old, ugly plants that have been trimmed into unnatural shapes and ones that are struggling to survive in less-than-optimal conditions. Focus on impact In a commercial landscape, bigger is usually better. 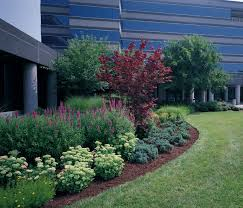 Large elements such as commercial parking areas, retaining walls, and other features demand bigger, more colorful plants. 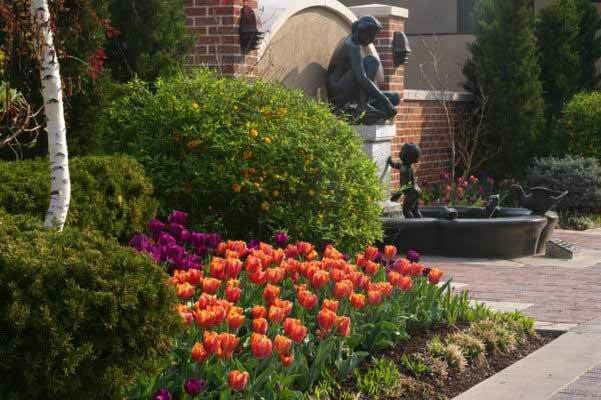 Impact is all about size, color, and diversity in plantings. Focus on long-term maintenance Carefully choose plants and features to fit the environment and its conditions. Plants that will not adapt easily to their surroundings will cost a lot more in the long run to maintain or replace. Focus on people Commercial landscapes and people interact in many different ways and so it’s important to design and plant with people in mind: how will different areas look from different perspectives? What will people see when they first drive into the parking lot, walk on the sidewalk, and look out windows? A tasteful, thoughtfully planned and expertly reinvented landscape creates a unique commercial property and a marketing focal point that attracts discriminating commercial tenants and buyers.